A good pizza is simple. In theory. Good dough, wood oven, excellent toppings. Easy peasy. And yet so many places get it wrong. But not Pizza Pilgrims. The Exmouth Market branch is the third in London (after Soho and Kingly Court). It’s just as good as the other two, and -miracle- it seems to be a bit less busy! Once past the bright green door, you enter a temple for good dough. Totally my kind of religion! And a really cool temple it is, complete with a gallery of pizza boxes (you can even create your own if you’re in a creative mood)! Downstairs, it’s all about honey-coloured wood and classic movie posters. A really cozy, no-nonsense atmosphere. And my favourite London pizzas. Simple, quality ingredients on the best sourdough crust a pizza lover could dream of. I have a fair few favourites, including the signature ‘Nduja, but went for the Salsiccia e Friarielli this time. 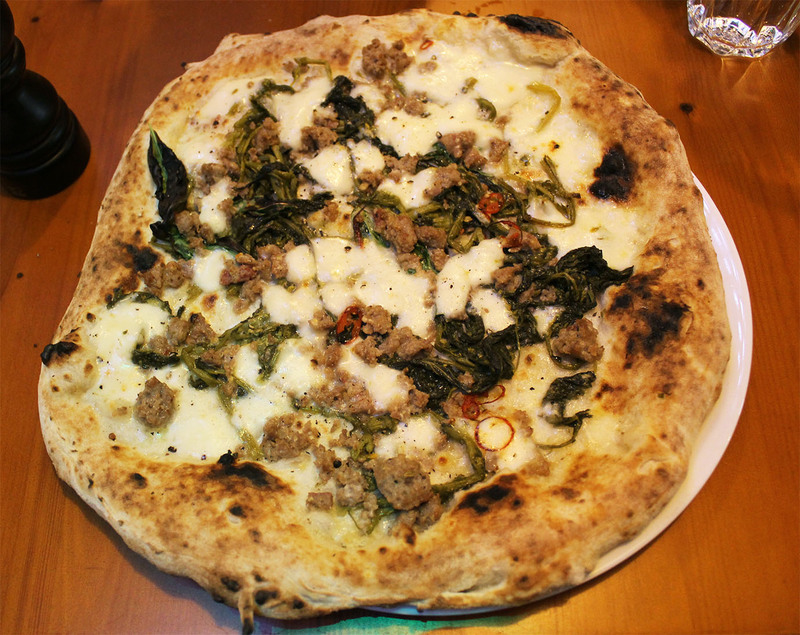 A white pizza topped with fresh fennel sausage, wild broccoli, fior di latte, parmesan, basil and chilli. Drizzle with a bit of the good stuff. Look at how happy it makes her! Proof if you ever needed one that chilli oil is the key to happiness! Then grab a slice and tuck in! And at that price, who would blame you? Oxford Circus is my own idea of hell. There are just SO MANY PEOPLE everywhere ALL the time. But one of the perks of being a Londoner is knowing how to avoid the crowds. No matter where you are, there’s always a little nook for you to retreat to. And as I was shopping the other day, I might just have found my new favourite one. Nestled right behind H&M, Ethos is every vegetarian‘s dream come true. A restaurant where they’ll FINALLY be served something else than goat’s cheese tart or mushroom risotto! Step inside an you’ll find yourself in some sort of Swedish-forest-met-IKEA-catalog. And maybe a muffin or two to go with it? Almond, maple & raisins was definitely an excellent choice to go alongside a cup of Earl Grey! The Raspberry & almond pancakes are out-of-this-world good. Soft and fluffy without being too airy or sweet, needless to say they were devoured within seconds. Another day, we returned for dinner and tried out the buffet. I forgot my camera then (baaaaad blogger! ), but let me tell you that if you happen to walk around London with a vegetarian friend or three, it’s an excellent option. Wander around the buffet, pick a bit of everything (don’t miss out on the babaganoush, the olives and the sweet soy halloumi!! ), weight your plate and enjoy! There is no better way to celebrate the beginning of the Christmas season (yes, it’s only mid-November, I know, I know!) than with a cup of spicy mulled wine. Plus mince pies and candy canes. And London first Mulled Wine Festival, organised by Yelp London, has it all and then some more, making it the best thing that could have happened to your weekend. And when you see a big group of Santas, you know you’re in the right place! Download the app and check into the event, get your wristband from one of the fantastic Yelpers on site (and say hi! for me), and you’re all set to go! Go where I hear you say? The most wonderful place of them all. A hot cup of the Christmas staple will make you forget that winter is coming. And soon you’ll be saying that it’s ice cream weather. A side of mince pies is pretty much obligatory. 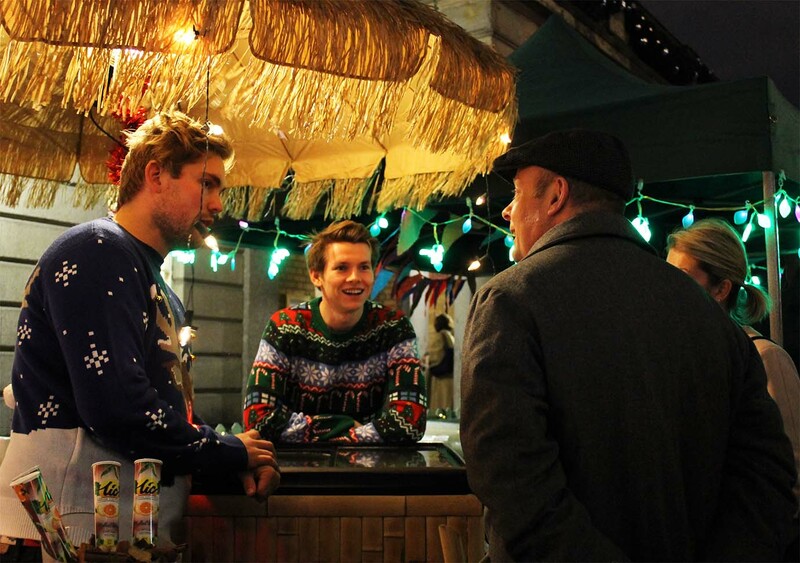 London’s first Mulled Wine Festival sure is the best way to welcome the festive season!! Yelp’s #MulledWineFest is in full swing on Covent Garden Plaza today and tomorrow (November 13-14), 12-9 PM. Entry is free if you download the Yelp app and check into the event.